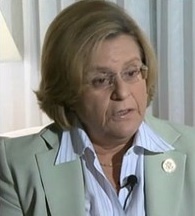 Rep. Ileana Ros-Lehtinen, Chair of the Foreign Affairs Committee of the US Congress, is withholding basic heath care from children who live in the world’s largest outdoor prison, the Palestinian Occupied Territories. Specifically, Congresswoman Ros-Lehtinen (R-Fla.) (at left) “is keeping her House of Representatives committee from considering approval of $192 million in humanitarian program assistance”. If this were happening in an American community, Child Welfare agencies would descend on the offices and homes of these American adults and demand that they release the children from an unsafe and unhealthy environment. They might even move to arrest some of the leaders, including Florida Congresswoman Ros Lethiene. Unfortunately, for Palestinians in need of this assistance, there are no officials with authority to arrest members of the US House who are eager to punish Palestinians for their bold attempt to break the bonds of Occupation. In another corner of the United Nations complex, Secretary of State Hillary Clinton has warned the United Nations Educational, Scientific and Cultural Organization (UNESCO), that it should “think again” before granting Palestinians membership to the international agency. Palestinians are seeking to join UNESCO as a part of their diplomatic campaign for statehood. Forty out of 58 UNESCO board members now support the Palestinian request. The US is one of four members opposing membership. The request will be voted on at the end of the month. Secretary Clinton insists that “the decision about status must be made in the United Nations and not in auxiliary groups that are subsidiary to the United Nations”. US Republican Congresswoman Kay Granger, who chairs the sub-committee that disburses US money for diplomatic purposes, said in a statement she would “advocate for all funding to be cut off”. What Republican Congress members Ros-Lehtinen and Granger, and Secretary Clinton, are saying, is that the path to Palestinian freedom lies entirely in the hands of the Israeli Zionist government “through negotiations”. These US power brokers are demanding that the Palestinians “negotiate” with Prime Minister Netanyahu. This would not be a negotiation for freedom, it would be a surrender to the Israeli government, whose leaders have demonstrated consistently that they fully intend to control every inch of land from the Jordan River to the Mediterranean Sea. Why does the US Congress, the US President, the mainstream media, and the leaders of the American religious communities, tolerate this violation of this country’s standards of fairness and compassion? The answer is simple: The decision makers in these US institutions have been manipulated into sanctioning the racial bigotry that has allowed the Zionist leaders of the state of Israel to corrupt American foreign policy. To be sure, there was much indigenous material to work with in this corruption project. Descendants of the European settlers who invaded what became the United States of America, have long been in the grip of racial bigotry. The enemy “out there” in the untamed wilderness were natives of this land who resisted the presence of white settlers when it became apparent that their intention was to conquer, not to share, the land. The settler-pioneers who formed the United States had to live with what they had done. They justified their conduct by lying to themselves. They did this by declaring the Big Lie, that they were superior to the people whose land they conquered. The modern state of Israel was born in the grip of this same Big Lie. The new state was created in the aftermath of the horrors of the Holocaust, and mixed with a “divine right” found in only one interpretation of the Hebrew scriptures which offers a specific way of reading the scriptures to manipulate a religious mythic history into a bigoted ethnic cleansing and the subsequent military occupation of the Palestinian people. In his dramatic speech delivered to the US Congress on May 24, 2011, Israeli Prime Minister Benjamin Netanyahu, confirmed his control over the US Congress as he repeated the myth of “his” ancient people as validation for a modern land grab. The Big Lie of racial superiority in the speech evoked 29 standing ovations from the combined US House and Senate membership, a shameful moment in American history. These words from Netanyahu are easily refuted, They are also rooted in the Big Lie, which grants nonexistent rights to a people who declare themselves to be superior on racial and/or religious grounds. It is hard to imagine that a majority of the congressional members who cheered Netanyahu’s speech believe in, or even understand, the biblical literalism that stands behind his biblical shaping of an ancient history. Let us be gracious for a moment: Netanyahu has every right to believe his version of the Hebrew scriptures. He does not have a right to impose this belief on those of us who do not believe in his brand of biblical literalism used for political purposes. Do those members who cheered and stomped their feet know what they were endorsing? Would more than a handful of them be able to find the Bedouin Arab village of Tuba-Zangariya on a map of northern Israel, where Jewish extremists recently set fire to a local mosque, the most recent example of Israeli racial bigotry in action. Would they care? These legislators and their fellow citizens, are easily manipulated by Israeli hasbara (propaganda) campaigns that employ the fear of being charged by others as bigots. Zionists know they hold a tool of control over US culture: The dreaded fear of being accused of anti-semitism. New York Times columnist Nicholas Kristof, who writes largely about world poverty, will, on occasion, bring his compassion into the Palestinian arena. In a recent column he asks: “Is Israel Its Own Worst Enemy?” . Prime Minister Benjamin Netanyahu is isolating his country, and, to be blunt, his hard line on settlements seems like a national suicide policy. Nothing is more corrosive than Israel’s growth of settlements because they erode hope of a peace agreement in the future. Mr. Netanyahu’s latest misstep came after the Obama administration humiliated itself by making a full-court diplomatic press to block Palestinian statehood at the United Nations. At a time when President Obama had a few other things on his plate — averting a global economic meltdown, for example — the United States frittered good will by threatening to veto the Palestinian statehood that everybody claims to favor. With that diplomatic fight at the United Nations under way, Israel last week announced plans for 1,100 new housing units in a part of Jerusalem outside its pre-1967 borders. Instead of showing appreciation to President Obama, Mr. Netanyahu thumbed him in the eye. I realize that many insist that Jerusalem must all belong to Israel in any peace deal anyway, so new settlements there don’t count. But, if that’s your position, then you can kiss any peace deal goodbye. Every negotiator knows the framework of a peace agreement — 1967 borders with land swaps, Jerusalem as the capital of both Israeli and Palestinian states, only a token right of return — and insistence on a completely Israeli Jerusalem simply means no peace agreement ever. For me, Kristof makes the “final agreement” overly simplistic. He also grants far more to Israel than he should, but his strong criticism of Netanyahu is a refreshing addition to the pages of the New York Times. Israel has thus far been successful in its pattern of racial bigotry first, by placing the Palestinian population behind the prison walls of a military Occupation. And second, by manipulating an American foreign policy that follows Zionist dictates. Did we go to war against Iraq and Afghanistan because we believed the lies of the Bush Administration? In part we did, but it was also a military decision influenced by the goals of the State of Israel and those supporters of Israel in the US, who believe the US and Israel have a common mission to make the world safe for Israeli and American expansionist control. Former Senator Charles Percy, of Illinois, died September 17, 2011.. Percy was one of the last of that dying breed, a “moderate” Republican. He lost his Senate seat in 1984 to then-Congressman Paul Simon, a liberal Democrat. Zionist forces supported a conservative Republican against Percy in the primary, branding him as pro-Palestinian because he had been open to the US government “talking with” Yasir Arafat. That, of course, was forbidden. Arafat was an Israeli-designated “terrorist”, an “untouchable” for American politicians. Later, Arafat became a “partner” for peace and Israel allowed him to return to a headquarters in Gaza where he was expected to act as Israel’s “sheriff” for the Occupied Territories. Arafat lost his sheriff’s badge before he died. He was succeeded by Mahmoud Abbas, who at the time was deemed a more acceptable leader to Israel. This 13-minute video is still pertinent as we watch the unfolding of the Palestinian effort to secure acceptance by the United Nations. Carter’s openness to Hamas in this video is an example of what enlightened American leaders could do if they broke their bonds of Israeli control. How tragic that our foreign policy in regards to Israel is to support the radical right-wing Zionist vision of the israeli state which is imposing an apartheid system in the occupied West bank, rather than an Israel of true democracy and human rights, which is in the long- term more of a pro-Israel position. We may as well be honest and make Israel our 51st state and continue to help them dis-possess, kill and then put any of the Indians (oops, I mean Palestinians) who are left on the reservations. I am awed by the courage of Israelis who protest what their beloved country has become, especially the Breaking the Silence former soldiers of the IDF. Those who remain silent in the obvious face of criminal, brutal and unjust treatment of the downcast will eventually pay a price. A Confession of Faith of most congregations in my denomination in part says this: “In sovereign love God created the world good and makes everyone equally in God’s image, male and female, of every race and people, to live as one community.” The clear assertion is that there is no master race, no superior gender. I take this seriiously. Because we belong to God, states the authors, “we belong also to one another.” As long as we buy into the Zionists Hasbara that Zionists are superior there will never be peace. Thank you again, Jim, for your forthright honesty! Thank you very much for this well resourced and documented work. I could not possibly express better than Jim has my personal, decades-long outrage at the Zionist ideology transition from brazen colonial-style invasion and subjugation of another people and their sacred land to an outright criminal psychosis quite unable to function with commonly accepted rationality, with any measure of sanity. Despite the reality that they are aided and abetted by the vindictive likes of Ros-Lehtinen (and a myriad host of others…Cantor, Ross, Perle, on and on and not only in the U.S…. ), Zionist Israel must be forced to realize that it and its Jewish people are not “chosen” and that they must, on pain of staunch opposition and sanction, recognize and accept every one of the legitimate, historically verifiable grievances and aspirations of the Palestinian people. How to make that happen is the conundrum that has frustrated sane people for far too long…. Thanks for a great review, Jim. Palestinians should actively seek foreign aid from several countries around the world, in order to counter-balance Zionist blackmail and monopoly over US foreign policy. There are countries like China, Turkey, India, Brazil, Iran, Russia, Venezuela, to name a few, who would like to establish or enhance their interests with 1.5 Billion people and to be remembered in the history books as supporting Palestinian statehood, freedom, and independence. The US enforcement of Zionist dictates that David should be forced to negotiate with Goliath, (or European Jewish leadership should negotiate with Germany’s Nazi regime, after World War II), clearly reveals the evil intentions of the US administration making such a preposterous proposal. If our Zionist-led State Department vetos Palestinian statehood, and insists on “dictated unilateral negotiations”, then there will be an uprising and, for generations to come, Arab and Muslim nations will remember the US stand with deep resentment. While the Zionists will be snickering behind the scenes, vital US interests will deeply and irrevocably suffer for decades to come. Oftentimes I fear, and there are ample pieces of evidence such as those laid out in your fine article Jim, that when Members of Congress and Israeli leaders speak about shared interests and values, they are referring to colonial historic parallels and anti-Arab racism. Thanks for naming the racism involved both in Israel and in the US. For however complicated the history and relations of Israel and the US to Palestine, I agree that racism is indeed a fundamental or foundational element in so much Israeli and US behavior and attitudes. It is important to say this clearly — that it is racism — yet so few do. And it is also important to note the tragic irony — that Jews in this country have over the years generally been courageous opponents of racism when it comes to African Americans, yet remain, it seems, largely unable to recognize or acknowledge the racism that is so blatant in Israel towards Arabs and Muslims and so implicit in the workings of groups like AIPAC and (irony of ironies) the Anti-Defamation League, as well as in the actions of Congress and State. I just wish that the peace prize could be taken back, and given to the real heroes, the ex IDF soldiers, that have had enough of being a camp gaurd on the natural owners of the land they swan around on , with their UZI POINTED AT THE HEADS OF PALESTINIAN CHILDREN. So to those soldiers that throw down their UZI, and refuse to be the lackey of an Aparheid state, I wish i had a prize to give you; But long may you live in peace those children when they grow up and remember you, for it will be those memories that will be the basis for the true peace for both peoples. This is not confined to Jewish representatives, but many of our “Christian” Reps are also Israel Firsters in my opinion, like Steny Hoyer from Md, and my own Rep from NYC, Michale Grimm. The list goes on and on. George Washington is not resting peacefully. Nationalist and racist movements have always used “the fatherland” argument when they set about displacing people from their land and their homes, by hook or crook. In this case, “Abraham” serves as the father figure. Strange, though, considering that “Abraham” is also the patriarch of the Palestinians. The Congresswoman is simply hoping that she will receive Jewish support and money for taking her stand. She is trying to manipulate Jewish people into funding her future political campaigns. She thinks she is a real smart cookie. It’s all pretty transparent.